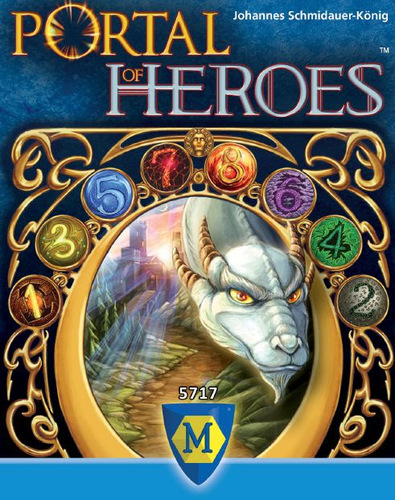 In Portal of Heroes, players are heroes that go through portals to the world of Molthar and “bind fantastic beasts” to you – which is boardgame rule speak for discarding appropriate cards in order to collect other cards. 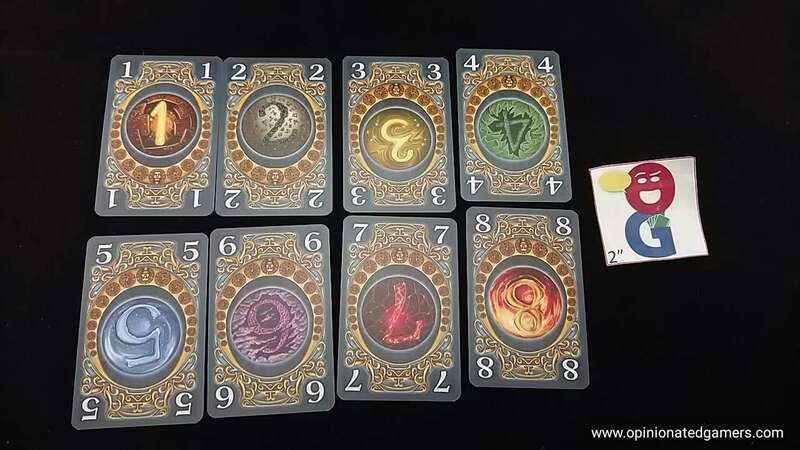 There are two decks of cards in the game – the Pearl cards which are numbered 1 to 8 and the Character cards. Two Character cards are dealt face up to the table, and four Pearl cards are dealt face up to the table and the rest of them are left as a facedown deck. 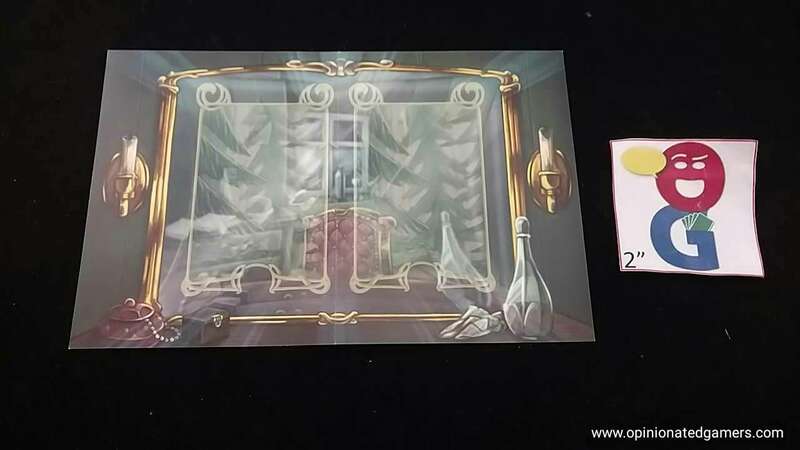 Each player also gets his own portal board which can hold up to two Characters. On your turn, you have four options. 1 – you can take a Pearl card; either one of the four face up cards from the table or the top card of the deck. If you take a face up card, replace it with the top card of the deck. If you reveal a card with the Swap icon on it, you immediately discard the two Characters on the table and put two new ones from the Character deck on the table. 2 – Replace the four face up Pearl cards – simply discard the four cards on the table and replace them with the top four cards from the deck. 3 – Collect a Character card – choose one of the two face up Character cards OR the top card from the Character deck and add it to your portal. You can only have two cards on your Portal. If you already have two and you want a new Character, you must discard one of your two existing Characters first before choosing a new one. 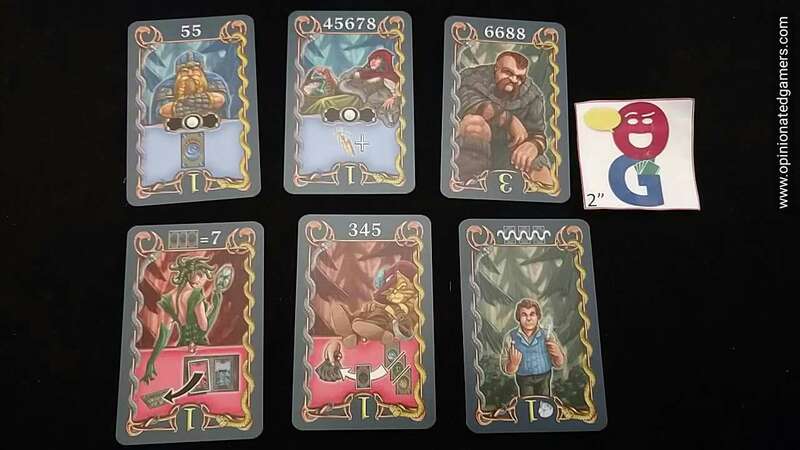 4 – Activate a Character in your Portal – Each of the characters has a set of numbers on the top of the card. If you can discard matching numbered Pearl cards from your hand, you can activate the Character. Rotate the Character over to show how many Power Points you collect for this Character. If there are diamonds next to the Power Points, you take Character cards from the discard pile (They all have diamonds on the back). Diamonds can be used to increase the value of a Pearl card by one – you may only use one Diamond per Pearl card, and you can only increase the value of a card. When you activate a Character, each has an ability on it that you now use. Abilities with a Red background are done immediately. Blue background abilities are permanent abilities that change the rules for you for the rest of the game. After you take your turn, you are limited to having 5 Pearl cards in your hand. If you have more than 5, you must discard down at that time. The game continues until someone has 12 or more power points from activated Characters. This triggers the final round – play continues to the end of the current round AND then each player gets one more additional turn. The player with the most Power points at the end of the game is the winner. Ties go to the player with the most Diamonds. Portal of Heroes is a nice little card game. I first played it at Essen 2016, but it was in my last hour of being in the halls, and while I liked the game, I didn’t manage to find a copy prior to leaving. I was a little sad because my brother got a copy and he really enjoyed it – but then again, I’ve got a drawerful of card games that don’t get played that often (as I have so many) – so it wasn’t a high priority for me. Now that I have a copy though, it has gotten a lot of play, and I’m a bit sad that I missed out on a few months of enjoying the game. 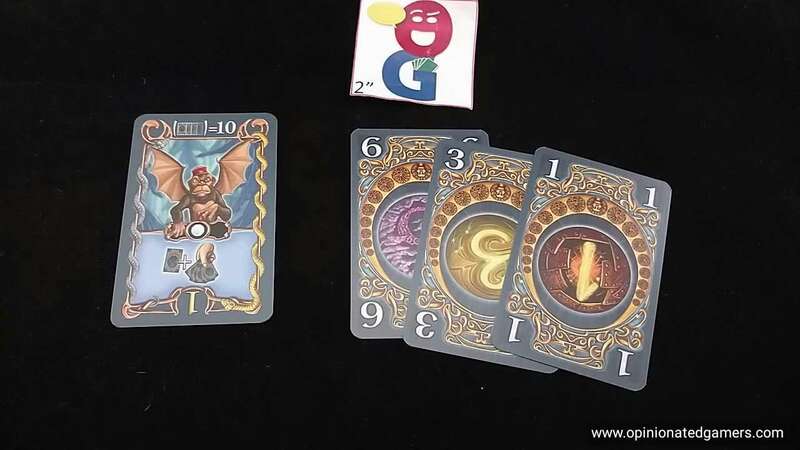 Mayfair seems to be targeting great cards games (this one and Oh my Goods! from the year prior) to be reprinting in English. Portal of Heroes is one of those games where you always want to do two or more things on a turn but you can only choose one. You’re often in a battle between trying to lock in a Character card that you want versus picking up the Pearl cards that you need. You can see the cards in your opponent’s portals, so you also know what they’re trying to collect as well. Though you probably wouldn’t benefit much from taking a card that you didn’t need at all – there is certainly room for defensive play, and it’s a worthwhile strategy to keep in your back pocket when you need it. Choosing the characters to add to your portal seems to be the biggest decision in the game. They have multiple functions. Obviously, you need them to score VPs to win the game. But, sometimes, you might choose one based on the cards you have in your hand. Or, other times, you’ll choose one based on the special ability that they will grant you once you have activate them. I personally like to try to get the ongoing abilities that either give me a card to use all the time or that increase my hand limit. However, a lot of times, the choice of character simply comes down to what I have in my hand at the time I need to choose a new character to place in my Portal. I will say that the first few games requires a bit of rule-scanning as some of the iconography needs explanation – but it’s all in the rules, and after about three games, I find that I don’t really need to refer to the rules at all. I have made a couple of extra color copies of the important parts in the rules and that has really helped out. The game has a definite ebb and flow to it, and on more than one occasion, I have wished that the game ended at 10VP instead of 12VP. Many of my games have seemed to bog down a little bit near the end – this is often where you see more defensive plays being made. If you know that John will trigger the end game if he finishes off a particular character, you might try to deny him cards that will help him activate it. Of course, moving the VP target might also just move the point at where the defensive techniques start – so it might not solve anything. There is a decent amount of game here in the small box with most of our games coming in around 30-45 minutes. As I said above, this often feels 5-10 min longer than what I am expecting, but it doesn’t overstay its welcome. Each of my recent games has played out a bit differently because of the different actions that I’ve earned through the characters, and I’m obviously still working out what might be a good strategy as I’ve yet to win a game with the new version that has been sent to me. Dan Blum (1 play): I liked it when I played it, but it turns out that the designer also sold the same basic design to Schmidt who turned it into Team Play (there was an article in Spielbox about this). I like Team Play a lot more – it doesn’t have the nice art or the variety of the powers, but the partnership aspect really makes the game, and honestly trying to track all the powers around the table is a pain.